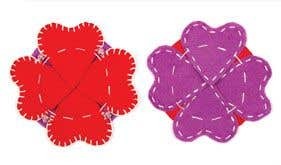 Use the circle coaster template to cut two base shapes from one of the sheets of felt. From the other piece of felt cut out four heart shapes using the template . 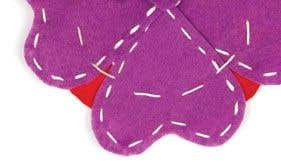 Place the hearts onto one of the circle base pieces of felt, so that the outer sections of the heart are overlapping the edges and the points are overlapping slightly. Pin in place. 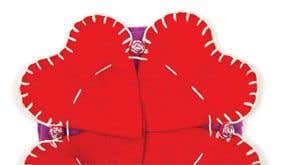 With a length of embroidery thread, stitch and secure a bead in between two of the heart motifs and work around the outer edge of the heart with blanket stitch. Secure a second bead between the next two heart motifs and continue working around the design until each of the outer edges have been worked and the beads have been secured and fasten off. 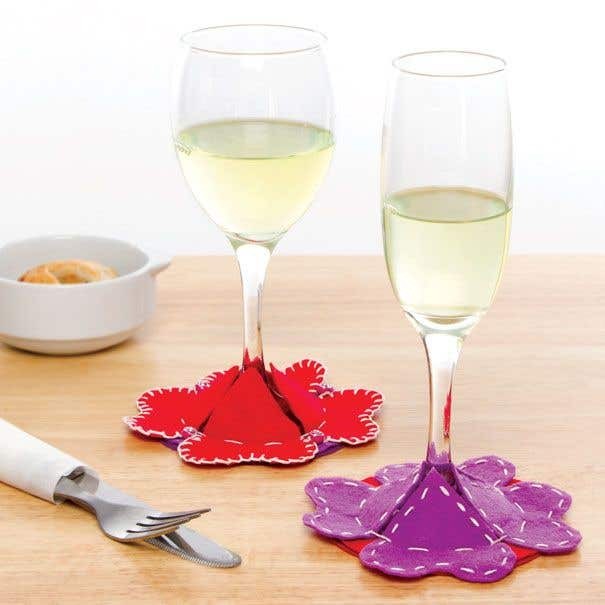 Place a wine glass into the centre of the coaster, with the point of the hearts sitting over the base. Use this as a guide and add a ring of running stitches to secure the hearts to the base of the coaster with neat running stitch and fasten off. Place the second felt coaster onto the back of the work to hide the stitching and secure in place with a few small dabs of glue. For a more simple design, omit the beads and work around each heart with a simple running stitch before layering and securing to the coaster.